Our host, Kristin Sunanta Walker, and Samantha Dahlborg talk bullying and mental health on this episode of Mental Health News Radio. 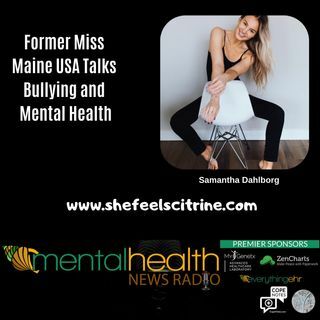 Samantha Dahlborg is a 25 year old visionary, professional model, former Miss Maine USA and current self-love junkie. She runs her own personal development blog called, SHE FEELS CITRINE, that’s designed to uplift, inspire and motivate young women to find their passions and live their best life. She often keeps an open communication with her followers on social ... See More media, reminding them that not every day is the best day, but it’s how we make the best of every day. She posts behind the scenes of photoshoots, pictures from her travels and her art! When she’s not modeling, blogging or traveling, you can find her at home with her boyfriend, Tyler and dog, Oakley dreaming up their next big adventure. If she’s not there, she’s probably at HomeGoods in the decor/candle isle. Samantha takes pride in who she is, was and is becoming and hopes that in a world where you can’t escape social media, her platform will empower and create a connection with others.